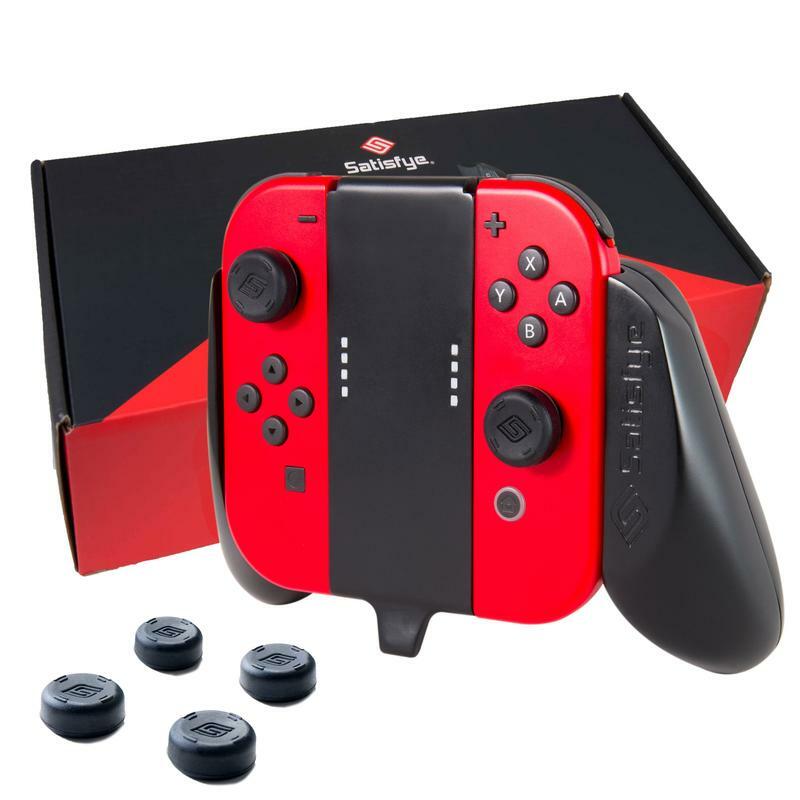 THE ULTIMATE GAMING GRIPS FOR THE NINTENDO SWITCH! As much as we all love to walk around with our Nintendo Switches, we face a few minor issues when we go on a gaming bender. One of the most common issues is the flat design of the console because there are no curves or ergonomics to it. 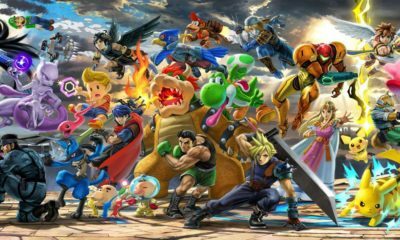 So, while playing in handheld mode we do get this odd feel of not having the best grip especially for the more action packed games where we need to use all of the buttons all the time. This becomes clear as soon as we get home, dock the switch and pick up the pro controller and right away our gaming level goes up a few notches. It is all due to better feel of the controller which we miss in the handheld mode since the Joy-Cons sit flush with basically the tablet. 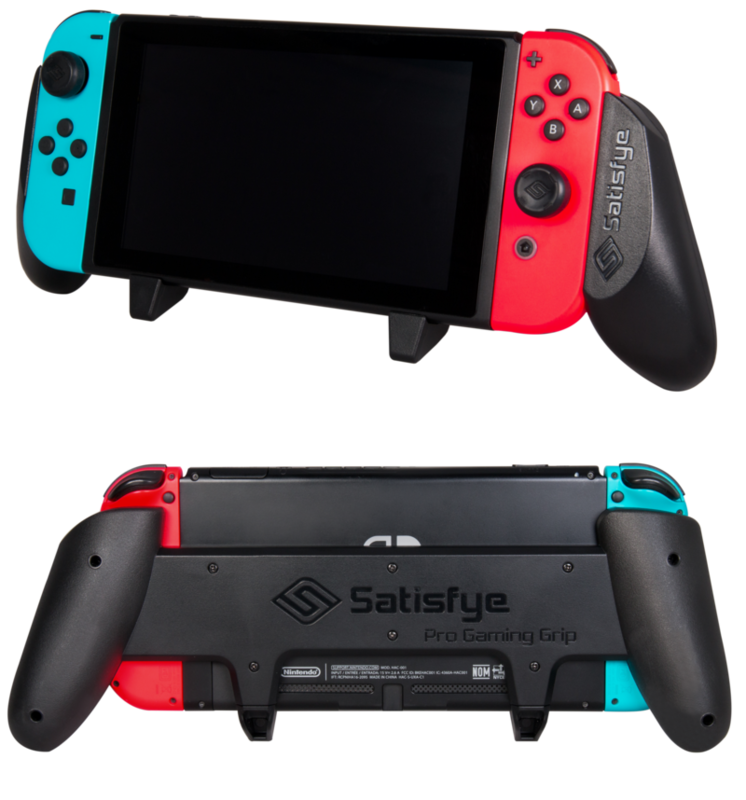 Now however there are a few solutions out there for this particular issue, and the one that’s been making the most amount of noise us the new Satisfye Pro Gaming Grip. If you look closely to the Picture above then you can spot the asymmetric design of it and that is to compensate for the lower right hand side stick on the Joy-Con and give it a more ergonomic feel. It is one rigid piece and has legs under so you can prop it on a flat surface plus there are no locks on it because the perfect slide ins keep the console in place with no fear of it sliding out. 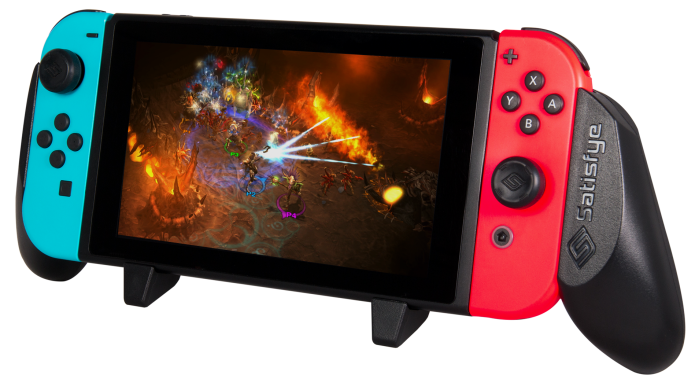 There is also the Satisfye Mini Gaming Grip for docked play. It has the same asymmetrical design but a much smaller footprint of course. After circulating among a few reviewers, it is deemed to be better than the one comes with the Switch console. It is sturdy and with that ergonomic design, long term play feels more natural. Pro Gaming Grip is $22 while the Mini Gaming Grip is $20. These devices enhance the gameplay and with holidays around the corner not a bad item to gift items either.